SQUANDERING YOUR LIFE ON YOURSELF IS WASTEFUL. “Whoever wants to save his life will lose it, but whoever loses his life for Me will save it.” Luke 9:24 NKJV. In the United States, we observe Memorial Day, an annual day to remember and honor those men and women who loved their country more than their own lives. The aging Apostle John wrote of such, “They loved not their lives unto the death.” Revelation 12:11 KJV. Every country values the men and women who serve in defense of their neighbors and fellow countrymen. Their sacrifices are immeasurable, especially those whose lives are required for the protection and safety of others. For all of those who serve in our military, or guard our borders, or protect our homes and cities, we give thanks. But my thoughts today are for those of us who claim to be His disciples. Dare we value or be less committed to sacrifice for the Kingdom of God? Jesus said, “Greater love has no one than this, that he lay down his life for his friends. You are my friends if you do what I command. I no longer call you servants, because a servant does not know his master’s business. Instead, I have called you friends, for everything that I learned from my Father I have made known to you. You did not choose me, but I chose you.” John 15:13-16 NIV. Imagine the honor of being chosen by the One Who died on a cross for your sins. There can be only one appropriate response – to give yourself completely to do His will. The Apostle Paul embraced the price of obedience, “And now I am going to Jerusalem, drawn there irresistibly by the Holy Spirit, not knowing what awaits me, except that the Holy Spirit has told me in city after city that jail and suffering lie ahead. But my life is worth nothing unless I use it for doing the work assigned me by the Lord Jesus – the work of telling others the Good News about God’s wonderful kindness and love.” Acts 20:22-24 NLT. If men and women will sacrifice their lives for freedom, love of country, and the safety of their families, should we who are called by His Name and redeemed by His sacrifice not give our lives in His service and the advance of His Kingdom? Squandering your life on yourself is wasteful. “But mark this: People will be lovers of themselves, lovers of money, boastful, proud . . not lovers of the good . . lovers of pleasure rather than lovers of God – having a form of Godliness, but denying its power.” See 2 Timothy 3:1-5 NIV. That is a horrible but accurate description of anyone who lives for themselves. Sacrificing your life for God and others is rewarded. Jesus did not mince words, “If anyone would come after Me, he must deny himself and take up his cross daily and follow Me. 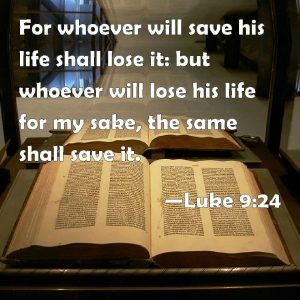 For whoever wants to save his life will lose it, but whoever loses his life for Me will save it. What good is it for a man to gain the whole world, and yet lose or forfeit his very self?” Luke 9:23-25 NIV. Your answer to Jesus’ question will determine you eternal destiny. Paul implored the saints at Rome, “I urge you, brothers, in view of God’s mercy, to offer your bodies as living sacrifices, holy and pleasing to God – this is your spiritual act of worship.” Romans 12:1 NIV. Sacrifice is every disciple’s obedience. Jesus’ own call to discipleship remains unchanged today, Those last words pose a haunting question for every one of us. Today I pray for you to live a life in such a way that models eternal values and priorities. What you have or Want Is Not What Life Is About. “God will supply all your needs from His own glorious riches.” Philippians 4:19 NLT. As I look at our increasingly secular culture, the culture of my generation was very different. We were taught old fashioned values such as: know the difference between your wants and needs, live modestly within your means, always be a good neighbor, put others before yourself, be grateful for God and proud of your country, value faith and family first, use cash not credit, save for the future, be thankful and content with what you have. The Apostle Paul is a good example, “I have learned the secret of being content in any and every situation.” Philippians 4:12 NIV. “Godliness with contentment is great gain . . . if we have food and clothing, we will be content with that” See 1 Timothy 6:6-11 NIV. In stark contrast, the current culture seems to entice you in subtle and not so subtle ways to want more than you can afford, to have more than you need, and to crave everything your neighbor has. In the subtlety and practical application, current values are seductive. Material possessions can become a little too important, as well as becoming an inaccurate measure of success and importance. Do not believe that what you have is who you are; you are so much more. How has this cultural change come about? There is a false philosophy that started as early as man’s origin in the Garden of Eden, a false philosophy that proudly claims that you can have it all, and you can have it now. Read Genesis 3. That was exactly how the devil seduced Eve and deceived Adam. They had it all in abundance, except for one small thing. The fruit of every tree was theirs to enjoy, except one. Somehow, she was lured to believe that without that, God was withholding something from her that she could get on her own. Well, you know how the story goes from there. Too many people have financially bankrupted themselves trying to have it all now, and at an even higher cost have bankrupted their souls in the process. You were never intended to have it all. It is not possible to have it all now. Listen to what Jesus advised, “Don’t be greedy for what you don’t have. Real life is not measured by how much you own.” Luke 12:15 NLT. Following the counsel of the Word of God will spare you a lot of needless grief and worry. Meanwhile, be content and faithful with what you have.“ Whoever can be trusted with very little can also be trusted with much.” Read Luke 16:10-12 NIV. The things that you have or want are not what life is about. Nor are those where true happiness and contentment can be found. Here is some Godly counsel. “Keep your lives free from the love of money and be content with what you have.” Hebrews 13:5. “Don’t be greedy for the good things of this life, for that is idolatry.” Colossians 3:5 NLT. The problem is your wanting things before God provides them and acquiring them without regard to their cost, now and or later. Best to live with this conviction born of God’s Word, “God Who takes care of me will supply all your needs from His own glorious riches, which have been given to us in Christ Jesus.” Philippians 4:19 NLT. Greed is an inordinate, unholy insistence of wanting more than God has yet provided and attempting to gain those things however you can as quickly as you can. That never works out the way you hope. “Your heavenly Father already knows all your needs, and He will give you all you need from day to day if you live for Him and make the Kingdom of God your primary concern.” Matt 6:32-33 NLT. Today, I pray for you to trust your Heavenly Father for what you need and be grateful for all you have. Everyone has influence, positively or negatively. The impact of some is beneficial; the effect of others is less so. Nowhere is there a greater necessity of sincere faith, and the opportunity for spiritual influence, than in the home. Since this weekend is Mother’s Day, let me share some thoughts about moms, especially my Mom. Certainly, in the home and family they are not the only influence; but for this occasion, Moms deserve the spotlight. Knowing me, God knew I would need a Mom that was especially patient, generous to a fault, immeasurably kind, and extravagantly loving. My Mom – Mildred Florence (McGinness) Randolph – was exactly that kind of Mom, and more. She was the eldest of thirteen children, the daughter of a pastor, an exceptional pianist, and the wife of a pastor, and best of all, my Mom. She was raised in a very modest home. My grandad always worked to support his family in addition to what the small churches of southern Illinois could provide in the 1930s and 40s. They were poor in comparison with others but rich in the things that truly matter – family, love, character, loyalty, and faith in God. They never thought of themselves as poor; they considered themselves fortunate. My Mom was raised in a Christian home. My Dad had not even been inside a church until he was seventeen. When he was a teen, his personal conversion resulted from my grandmother’s miraculous healing. A few years later, my Dad, a young Bible School graduate from Buffalo, New York, held a revival in a small church in southern Illinois and discovered the pastor’s beautiful and talented daughter playing the piano. Soon she was his wife . . and then she was my Mom. For that, I am graced and blessed. My Dad died in 1963, a young man, just 44 years old. My Mom died about 18 years ago at the age of 80. Even long after their deaths, my parents and grandparents still influence my personal faith. My parents were both significant, spiritual influences in my life, shaping who I am as a man, husband, father, and minister. Church and home were one and the same in our family. My Dad from his pulpit, and my Mom from her piano, taught me the inestimable worth of a personal knowledge of God and a life of faith and service. Every day of my life has been blessed by their words and personal example. Our marriage, ministry, and family of four generations now have a Godly heritage that could not have been earned or learned in a lifetime without them. “Blessed be the God and Father of our Lord Jesus Christ, who according to His great mercy has caused us to be born again to a living hope through the resurrection of Jesus Christ from the dead, to obtain an inheritance which is imperishable and undefiled and will not fade away, reserved in heaven for you, who are protected by the power of God through faith for a salvation ready to be revealed in the last time.” 1 Peter 1:3-5 NAS. My Dad taught me the rare value of faith and friendship, and the loyalty and integrity required in those. My Mom taught me a generosity and care for others that I am far from having mastered yet. My parents left me an inheritance counted in the very real currency of the lives and faith of our children, grandchildren, and great grandchildren. “A good man [or woman] leaves an inheritance to their children’s children.” Proverbs 13:22 NAS. You will afford your family a Godly example or allow them a perilous exemption. 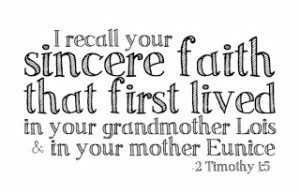 Sincere faith must be sacredly held, sincerely lived, and successfully shared with the next generations. Make your practice and profession of faith honest, and especially consistent. A Godly, family heritage that touches future generations can either continue or begin with you today. Today, I pray for you to value highly the faith entrusted to you and pass it on. Obey fully. Work diligently. Trust God’s process. “Trust in the Lord with all your heart; do not depend on your own understanding. 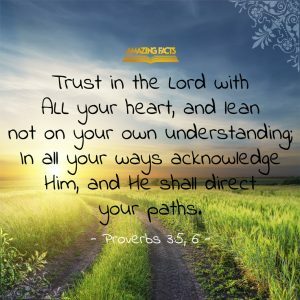 Seek His will in all you do, and He will direct your paths.” Proverbs 3:5-6 NLT. Immediacy is prized above delay. Instant gratification is a common goal. Patience does not seem to be our natural virtue. Experience should teach us that life is better when you cultivate patience. Patience encourages appreciation for what you gain, while promoting wiser use and better care of what you have. Patience is beneficial, promoting the necessity of effort, the importance of time, the reality of cost, and the satisfaction of accomplishment. In contrast, impatience generates unbelief, and unbelief interrupts God’s procedure by causing costly delays. Have you noticed that quick and easy accomplishments seem to hold less intrinsic value? At the moment, having what you want right now may seem more satisfying than waiting, but that satisfaction will be only temporary. The process of affordable sacrifice teaches anticipation. Anticipation fosters appreciation. Instead, we prefer immediate gratification. People readily defer cost and sacrifice till later, if they can acquire what they want now. Most of us are not content with process. We want what we want when we want it. And we want too much now, regardless of the real cost known or unknown to us. Credit is deceitful. Debt stresses marriages, divides homes, weakens families, and destroys lives. Our nation’s debt is a reflection of our spending addictions, as much as our politicians’ misbehavior. Process has beneficial elements. Paul echoed God’s principle of process this way, “Being confident of this, that He who began a good work in you will carry it on to completion until the day of Christ Jesus.” Philippians 1:6 NIV. God provides what He promises. He finishes what He begins. Trust God to provide what you need when you need it. “Trust in the Lord with all your heart; do not depend on your own understanding. 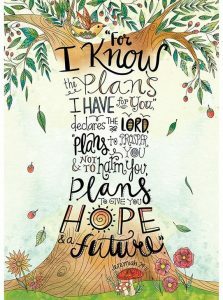 Seek His will in all you do, and He will direct your paths.” Proverbs 3:5-6 NLT. The final product is not seen until the full process is accomplished. You are wise to trust God. “As for God, His way is perfect.” Psalm 18:30 NKJV. His ways are righteous and just, yours and mine are not. Trust is always a work in progress. Trust grows when exercised. Trust grows by practice. Using the example of nature’s process, Jesus described the perfect ways of the Kingdom of God. “A farmer planted seeds in a field . . as the days went by, the seeds sprouted and grew . . because the earth produces crops. First a leaf pushes through, then the heads of wheat are formed, and finally the grain ripens. When the grain is ready, the farmer harvests it.” Mark 4:26-29 NLT. Jesus was describing the processes by which the Kingdom of God progresses and prospers in your life. Desire precedes effort. Effort creates anticipation. Anticipation encourages trust. Trust sees development. Development engenders growth. Growth produces a faithful harvest. Where do you see yourself in that process today? Harvest comes in God’s time through God’s process – after you Obey fully, Work diligently, and Trust God’s process. Today I pray for you to learn to cooperate with God’s purposes and processes.